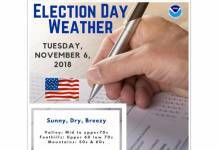 November 6, 2018 – Dry and mild weather continues with periods of breezy north to east wind through Friday morning leading to elevated to critical fire weather conditions. Clear skies across the region early this morning. The MFR-SAC gradient has weakened slightly from earlier but is still around 10 mbs. Breezy north winds of around 15-25 mph continue in the Sacramento Valley, mainly in the north and along the western edge, while local gusts of 25-35 mph are present in the Coast Range and northern Sierra. Current temperatures are cooler across most of the area compared to 24 hours ago and range from the upper teens to mid 20s in the colder mountain valleys to the lower 60s over the milder (breezier) portions of the Central Valley. Pressure gradient forecast to decrease some today into Wednesday, but then increase significantly Wednesday night and Thursday as strong high pressure builds inland in the wake of disturbance digging into the Great Basin. Fire weather conditions expected to increase from significant to critical during this time frame and Fire Weather Watch continues. 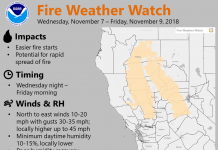 Gusty northeasterly wind expected in the eastern foothills and west slopes of the Northern Sierra Nevada Thursday into early Friday with local gusts up to 50 mph possible. Strongest wind over ridges and through favorable west-facing canyons. Pressure gradient trends down Friday morning. High temperatures will continue upwards of 10 degrees above average this week with 70s in the Central Valley and 50s to lower 70s for the mountains and foothills. Overnight lows will be downright chilly in the wind-sheltered mountain valleys with teens and lower 20s. Colder overnight lows in the mid 30s to lower 40s are expected in the Central Valley once winds subside beginning Wednesday night. A ridge of high pressure will remain a fixture in the forecast, resulting in dry conditions and above normal temperatures. Temperatures will trend upward slightly as the ridge axis gradually shifts inland Sunday into Monday. Daytime highs are anticipated to be in the 70s across the Valley, with mid 50s to mid 70s over the mountains.